There are hosts of animals that are known to carry rabies, combine that with the fact that squirrels are one of the most common animals in backyards and parks across America. In addition, hunters and hikers run across squirrels all the time, and squirrels could bite you if you are too close to them. So, do squirrels carry rabies is a question often asked around the country. So, Do Squirrels Carry Rabies? Fortunately, squirrels do not generally carry rabies although it is possible in fact any warm-blooded mammal can carry or contract rabies. 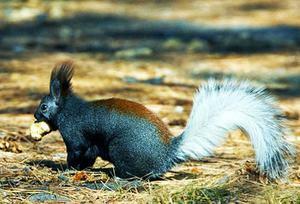 Squirrels are one of the few animals that will not cause a rabies protocol in a hospital, clinic or veterinary office. Squirrels are known to be benign most of the time, but there is no guarantee that the squirrel you were bitten by is free of rabies. It is best to have all bites checked by a doctor to be on the safe side. First, it should be noted that aggressive squirrels are not common, but it is possible that you may encounter a protective mother when she has her babies nearby. You know that these squirrels are especially upset with you when they take a few moments to stare you down instead of running into the trees. Therefore it is difficult to be bitten by a squirrel because of how close you must get to an agitated squirrel to be bitten. Squirrels are some of the fastest and most agile creatures in the wilderness. They can run away from you faster than you could possibly imagine, and you must be incredibly close to them before they will bite you. There have been reports of squirrel hunters that were bitten as they were collecting squirrels they have shot, but this situation is very rare. You may sit near where a squirrel is walking, and you may accidentally touch the squirrel as you rest. The squirrel may choose to bite you, but more then often they’ll run away. 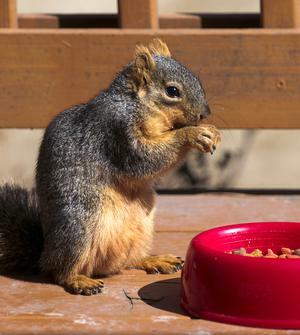 A household pet that is bitten by a squirrel should be taken to the veterinarian immediately. Your pet should have had a rabies vaccine at some point, but the veterinarian can check for a rabies infection in the wound. The wound must be dressed by a professional, and your veterinarian can report the incident to the local wildlife authorities. Reporting the incident is vital to everyone’s safety, and the veterinarian may hear back from the wildlife authorities about a rabies infestation in the area. You may not have specific knowledge of how the squirrel was behaving when your pet was bitten, but you may help other pet owners who come to the veterinarian with similar troubles. Your pet will be sent home with a fresh bandage, and you will be contacted if your pet needs to come back in for more testing. You must never forgo a trip to veterinarian when your pet has been bitten. Erring on the side of caution is much wiser than avoiding the problem. Humans that are bitten by a squirrel will need to provide information to hospital or clinic staff about the animal, and its behavior. You can observe how the squirrel behaved before you were bitten, and you can report this information to the medical staff that treats you. Squirrel bites do not trigger the rabies protocols in a hospital, but you must tell the staff what the squirrel was like. Squirrels that are foaming at the mouth or acting aggressively must be reported to your local wildlife agency, and they will add your report to their records. A report of a rabies infestation may trigger further treatment or testing for your wound, and you must wait in the hospital long enough to get those results back. You will be given specific antibiotics if you were bitten by a rabid squirrel, and you will be sent home with a bandaged wound. Squirrel bites almost never get infected, but you should not avoid getting medical attention for a bite. The bite that you receive from any squirrel could be very deep, and you must receive medical attention even if it will not get infected. Medical professionals prefer to be cautious when you are bitten, but rabies shouldn’t be too much of a concern unless there have been reported rabies outbreaks in your area. It is hard to account for the other animals in the wild that might bite squirrels. Rabies infested animals that bite squirrels in the wild almost never pass rabies on to squirrels. 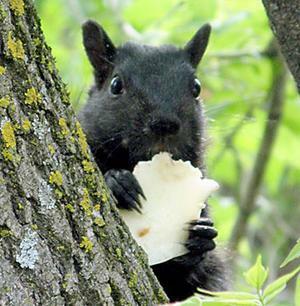 It is possible for squirrels to get rabies from a bite, but it is nearly impossible. A reported outbreak of rabies in your area likely does not apply to the squirrel that recently bit you simply because squirrels almost never get rabies. You may keep squirrels as pets, and your squirrels must be treated by the veterinarian the same way your other pets would be. Your squirrels are not exempt from biting you if they are your pets, and you must have them vaccinated routinely. Handle your squirrels carefully, and remember that your squirrels are strong creatures. In general a squirrel that you keep as a pet is more comfortable with you on the whole, and they may choose to bite you as they play with you. Your squirrel can open their jaw wide to bite you, and they can clamp down on your hand harder than what you think is possible from such a small animal. Be careful with your squirrels even when they have a name and sleep in your bed at night. In general, you are perfectly safe from squirrel bites, but do not avoid medical attention when you have been bitten. While the squirrel is nearly incapable of carrying rabies, it is possible, so make sure you get checked out. Your adventures will take you to some beautiful forests and trails where you may encounter some furry friends, don’t be afraid of these little guys, enjoy their presence and live in the moment. If you want to learn more about the squirrels including what squirrels eat, and where squirrels live, check out some of the other articles we have on the site.